This ongoing series concerning Purpose Driven Pope Rick Warren here at Apprising Ministries really begins Dr. John Piper made the dubious decision to feature the semi-pelagian (at best) Warren as the keynote speaker at the DG 2010 conference Think: The Life of the Mind & the Love of God. Where’s Rick Warren fit into this equation; it’s elementary m’dear Watson, on 10/10/10 Dr. Destiny drops a self-published book called Driven By Driven By Destiny: 12 Secrets to Unlock Your Future (DBD). And, the angling to be universal bishop of the visible church, Rick Warren wrote the foreword; but I’m afraid that it gets even weirder than Warren writing a foreword to a self-published book by a nondescript pastrix. His prompting to reach out to me for counsel affirmed my calling and destiny as spiritual advisor to great people. Ours is truly a divine connection as I have always been impressed with his ministry and literary work. And now our destinies have been miraculously aligned and driven with purpose. Why Would Rick Warren Want To Promote This Unknown Word Faith Pastrix? So, being that Warren tells us this book by pastrix LaVerne Adams is so important for our understanding as to how we determine what our “God-given destiny” is, and since Dr. Cindy Trimm is her mentor, then we have every reason to examine the theology of these people Rick Warren is bringing to our attention through his recommendation of the Doctor of Destiny. As Rosebrough has pointed out, this is not “guilt-by-association,” this is guilt by endorsement. The point is not, does Rick Warren agree with Cindy Trimm; but rather, why does he go out of his way to recommend to us a, then largely unknown, woman Word Faith pastor who clearly does? The bottom line is: In our examination of Warren’s motivation and discernment we’ve called Dr. LaVerne Adams to the stand. 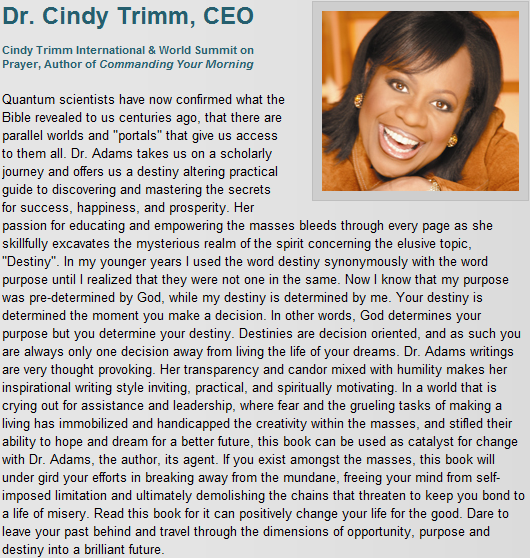 As we question her doctrine we find it’s been greatly shaped by Dr. Cindy Trimm; therefore it only makes sense that we now call Trimm to the stand to find out what she teaches people, such as Dr. LaVerne Adams, whom Rick Warren wants us to learn from. In other words, Dr. Adams has introduced her teacher Trimm into evidence; and now she also becomes a character witness, not only for pastrix Adams, but in a secondary sense concerning the motivation and discernment of Rick Warren in his seeking out LaVerne Adams in the first place. With this understood, now you have the proper backdrop from which to evaluate the following video clip of an appearance Dr. Cindy Trimm made on the show of her good friend, the notorious Word Faith heretic pastrix Paula White 11/9/09. a speaking being; He made us a speaking being, and whatever He wanted in this world, He spoke it into existence, and we have to reflect that as His representatives here in the earth realm…So words [actually] change molecular structure, cellular structure…if you’re releasing positive words in your life, it comes back as a positive experience. So we are really architects of our own future…you have to be able to admit that we are the architects of our future. Now we know that Dr. LaVerne Adams believes this kind of foolishness; so the question then becomea: Why would Rick Warren want to reach out to this Word Faith pastrix and use his influence to bring her right into the mainstream of the visible church? Could it really be that Warren himself does agree with this kind of lunacy in the Lord’s Name as well? Stay tuned. Paula White: …by the word of God; and in Psalms we read, “Oh God, You are my God; early will I seek You”. There are so many other verses in the Bible instructing us to seek God early in the day. As many of you know, I have taught you the power and the principle of first fruits. What you do first, governs what happens to the rest. Setting order to your day in an alignment with God can change your destiny. And today’s guest is here to share vital techniques for using the power of your thoughts and words to activate God’s greatest blessings at the beginning of your day. If you want God’s fullness to govern all day, you have to start it out right in the foundation. 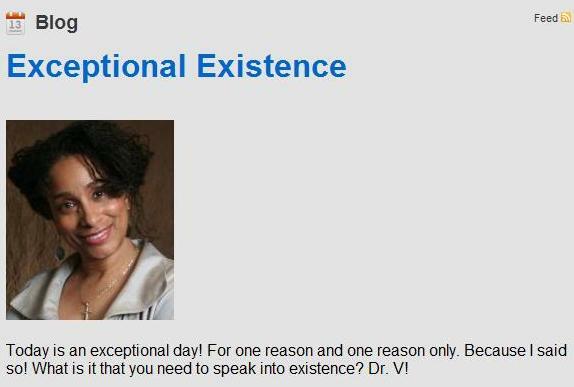 Dr. Cindy Trimm is a motivational speaker, life coach, preacher. She’s an amazing woman of God that God raised up for such a time as this. She’s been the ambassador of the goodwill for the state of Tennessee, received the 20th Century Award for Achievement, as well as distinctions from the Queen of England, and the governor of Bermuda. She’s partnered with business people, church, and world leaders, for more than 30 years to equip and empower millions to maximize their potential. And today she’s here to share with you, and with me, from her book Commanding Your Morning: Unleash the Power of God In Your Life. Please welcome my dear friend, Cindy Trimm. I love you Miss Cindy. White: Thank you for being here. Trimm: And thank you for having me. White: And you look fantastic; and I’m excited about what we’re about to bring because this is one of the most vital principles. [On-screen caption reads: Cindy Trimm Pastor/Author/Speaker] The Bible says in Psalm 11:3; If the foundation be destroyed, what shall the righteous do? So every day we have a building block with God. Our morning is the foundation. How do we command our God day with what we do early in the morning? Trimm: Well, we have to start the night before. That’s number one. Um, a lot-a times we don’t understand that 12:00 midnight people are already working especially when it comes to the powers of the airway. They’ve already set, you know, their agenda in motion, so by the time we wake up, we are waking to a world already in motion. Trimm: And so we’ve already lost, if you wake up at 6:00 in the morning, you’ve already lost 6 hours. But I found out you can download success into your day just by declaring; and God created us after His image, and after His likeness. [On-screen caption reads: God created us in His image, so we have the power to speak His will into creation.] And He’s a speaking being; He made us a speaking being. Trimm: And whatever He wanted in, in His world, He spoke it into existence. Trimm: And we have to reflect that as His representatives here in the earth realm. White: I love what you said, we can download success into our day. White: I say, God is already engineered us for success. So all we have to do is come in alignment with the decrees that God has made. We just have to agree with it. So when we start the morning, when it starts at midnight. We get in that morning, so I get up out of bed; how should I start my day? Trimm: And I was just doing some research, last night, just so happened to do some research on Notorious B.I.G.–Biggie. Trimm: And, what I–what I found out was his first album—he, he, he wrote the title of that album, I Don’t Wanna Live, [actually the title is Ready To Die]. White: (interrupting) Right; they never die. Trimm: No, they–it’s recorded. Even, um–I think it was Moses that said, I call on heaven and earth to record these declarations. Trimm: And it travels on a path. We call it a frequency; and it needs amplitude, and it needs a tower, in order to be transmitted. Trimm: Then negative occurrences are going to happen. Trimm: It’s like giving permission to, ah, negative powers to bring to you negative experiences. But conversely, if you’re releasing positive words in your life, it comes back as a positive experience. So we are really architects of our own future. White: So true. [On-screen caption reads: Positive words release positive things into your life.] Cindy, it-it is so vital, as we want to build a successful life; a good life, a god life, that we cannot ever see the implementation of it without the application of words. But there’s–before words, it really starts in our thought, in our heart, (Trimm agreeing) and it says, ah, i-i-w-we read the Scripture that talks about, um, as a man thinks in his heart, but really what its saying then–its true Hebrew meaning is–as you are in your heart, you were all along. In other words, how you think about yourself is how you’re gonna ultimately speak about yourself. (Trimm agreeing) Because our words–as much as people know this–and you’ve spend a life teaching on it, I’ve spent a life on–frame your world by your words. But we really have to have that paradigm shift where we, not only get our word in alignment with God, but we get our thought pattern (Trimm: Yeah, yeah, yeah.) centered on God’s word. Because the Bible says, out of the abundance of the heart the mouth speaketh. (Trimm agreeing) And so people say well, you know, “why is all that negative coming back on my”– Job said the thing I feared the most has come on me. Like you just, said we’re creating–we’re sending to the universe–and we’re sending to every, very single out there saying, speaking those death words of ourself. So we have to begin a transformation. How does that transformation start? Trimm: [On-screen caption reads: Your thoughts are the primary focus for creating your world.] And it’s going to travel on a frequency. And then, you know, when it comes to decisions one of the greatest stories, I know, that is told in the Bible is the story of the Prodigal Son. White nodding in agreement) He was prodigal because of immaturity and ignorance; [White: Right.] not the rebellion. But the Bible says that when he goes out he makes a decision. You cannot make a decision unless you perceive two options, so that means we always have an option. [White: Good stuff.] The Bible says you either choose life or death; blessing or cursing. So most of–80% of what happens to us–we’ve created it. Trimm: And a lot-a times we wanna play the role of victim. (White agreeing) And so if you play the role of the victim you start a negative cycle. And if you wanna break the cycle, you’ve got to admit, that I created this, and now it’s my responsibility to reverse it. So the Bible said, when he came to himself, [White: Right] he said to himself; so it’s the internal dialogue. It’s what you are saying on a continuous basis. Not what people are saying; [Onscreen caption reads: You must accept responsibility in order to reverse your situation.] and not what people are doing. It’s what you respond to in your mind. Trimm: What are rehearsing on a day to day basis? You know, and we’ve gotta be able to take our personal power back. And we take our personal power back, firstly, in our thoughts. [White: Right] As a man thinketh, so is he. I had to learn, personally, Paula; to take responsibility for my own life. I had to say to myself. (White agreeing) It was a decision that got me here. Trimm: So that means that, I’m always one decision away from living a better life. Trimm: It’s-It’s about choices, isn’t it? White: It really is. I-I say our personal decisions determine our destiny; [Trimm: Um-hmm.] because God gives us the, the blueprint, and I think it’s—[On-screen caption reads: You are always one decision away from living a better life] i-it goes back to say, you can’t conquer what you don’t confront–you can’t confront what you don’t identify. Trimm: (interrupting) I love it, I love it. White: And so we have to identify. And I’m going to go back to that Scripture we used, that out of the abundance of the heart, the mouth speaketh. White: I tell people put a tape recorder on yourself for 24 hours. [Trimm: Um-hmm. Um-hmm.] I think you’ll be shocked to listen [Trimm agreeing] to listen to some of the words that you speak; some of the conversation you’ve had; [Trimm: My God.] an’ then, if you don’t–and that’s the physical manifestation of it. [Trimm: Um-hmm.] Uh, an’ we already know according to scientific psychological studies, that basically most people think–ninety-something percent of their thoughts are negatively framed . [Trimm: Um-hmm.] And without the Spirit of God–of life working–and a conscious decision to shift that–to change that–you’re just repeating this constant negative battle. That inner voice you’re talking about’s that pathological critic. White: It says, “I’m not good enough; I can’t do it; I’ll never make it; I came from here,” but that’s not what God says. God says, “You can do it; you can make it; you’re more than a conqueror, you can do all things through Christ Jesus.” So, give us some of the practical things for the person–number one, they recognize they have options; 2. they make decisions; they identify their words, help that person break the pattern of negativity in their lives. Trimm: The easiest way; [On-screen caption reads: Ask yourself where you want to be in the future and place yourself there.] you have to ask yourself a question: “Where do I wanna be? Where do I see myself tomorrow? Where do I see myself twenty years from now?” And then, put yourself, where you see yourself. Trimm: You, you, usually repeat what you hear. Trimm: So you’ve gotta able to press your ear to the mouth of God. That’s number one–and that’s why we read the Bible. Whatever you meditate on, you feed; and whatever you feed upon, feeds you. LaVerne Adams, Driven By Destiny: 12 Secrets to Unlock Your Future [Dr. LaVerne Adams, 2009], x.
 Cindy Trimm, Commanding Your Morning: Unleash the Power of God In Your Life [Charisma House: A Strang Company: 2007], 5, 6.